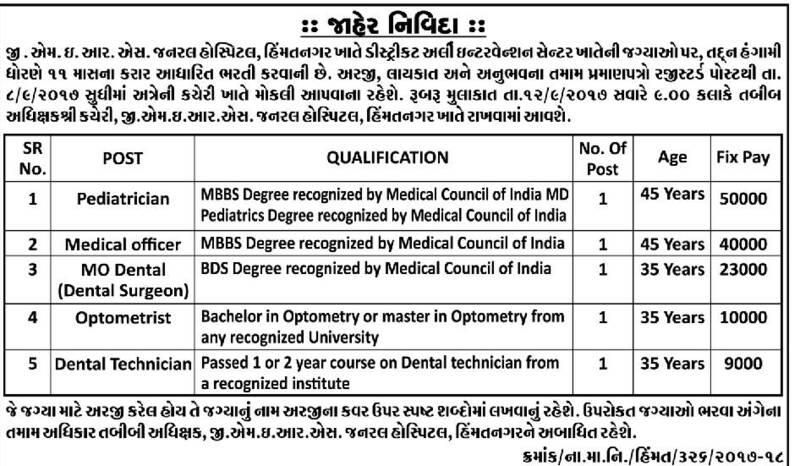 Gujarat Medical Education & Research Society (GMERS) General Hospital, Himatnagar has published Advertisement for below mentioned Posts 2017. Other details like age limit, educational qualification, selection process, application fee and how to apply are given below. MBBS Degree recognized by Medical Council of India MD Pediatrics Degree recognized by Medical Council of India. Bachelor in Optometry or master in Optometry from any recognized university. Passed 1 or 2-year course on Dental technician from a recognized institute. How to Apply: Eligible candidates may send their application & necessary documents to given address and remain present on Interview date mentioned below.